The afternoon was the highlight of a day at the Colosseum for the Romans. That was when the gladiators fought. 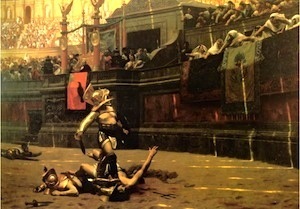 Gladiators in ancient Rome were usually slaves from conquered nations who were trained in a gladiator school to fight each other in the arena. When they fought, they were dressed in costumes to resemble the Barbarian tribes Rome had conquered. The fights had originated as munera, as ritual sacrifices in honor of the dead. 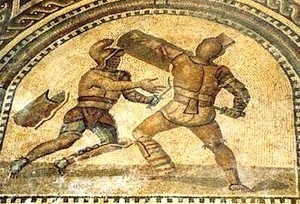 By the time of the Colosseum, the duel as a funerary ritual had morphed into forced mortal combat. The crowd just wanted to see highly trained men fight to the death for their delectation. The people were so avid for new thrills that Julius Caesar once had his gladiators clad in armor made of silver. The people were dazzled. Other wealthy patrons imitated him in their games, but the people were bored and booed. 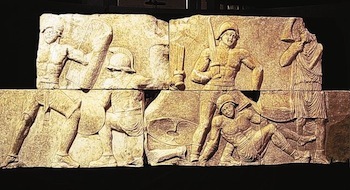 With the gladiators, the Roman populace had found their ultimate thrill. The fights were between skilled, trained men and the deadly outcome was unpredictable. 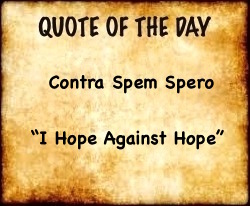 The people favored those men who fought valiantly with contempt for their own lives. 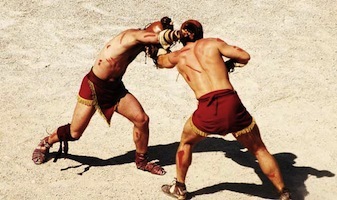 They ridiculed gladiators who played it safe or fought hard to preserve their lives. Often a fighter made a mistake and went down. 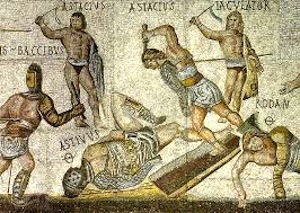 Gladiators were taught how to die. Vanquished, they would kneel on one knee and grasp the thigh of the victor. The victor waited for the sponsor (editor) of the game to give a thumb’s up or down. 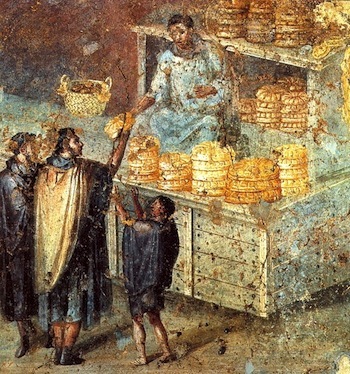 Occasionally the gladiator had fought so vigorously that the crowd would rise, wave their handkerchiefs or togas in the air, put their thumbs up and yell, “Missus! Missus!” (“Let him go!”). Most of the time the people wanted blood and would thrust their thumbs down and yell, “Jugula! Jugula!” (“Throat! Jugular Vein!”). The winner would grasp the head of the kneeling warrior with one hand. With the other he rammed his sword into his neck. A 50 minute BBC Movie about the real ancient gladiator named Verus from Moesia (modern Bulgaria/Serbia).